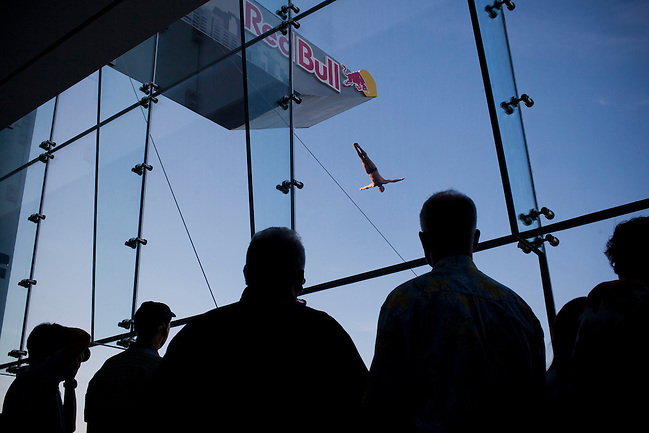 You know that marketing slogan “Red Bull gives you wings”? Well, wings wouldn’t have made this weekend’s Cliff Diving World Series much fun at all — the falling, after all, is the best part. An international field of daredevil cliff divers came to Boston for the 2012 competition, jumping off the roof of the Institute of Contemporary Art for the second year in a row. 8/25/2012 -- BOSTON -- Spectators watch as Kent De Mond of San Diego goes through his practice dives at the Institute of Contemporary Art at the Red Bull 2012 Cliff Diving World Series USA stop on Aug. 25, 2012. 8/25/2012 -- BOSTON -- A diver makes his fall from the roof of the Institute of Contemporary Art at the Red Bull 2012 Cliff Diving World Series USA stop on Aug. 25, 2012. 8/25/2012 -- BOSTON -- Alain Kohl of Luxembourg dives off the roof of the Institute of Contemporary Art at the Red Bull 2012 Cliff Diving World Series USA stop on Aug. 25, 2012. 8/25/2012 -- BOSTON -- Michal Navratil of the Czech Republic starts his dive in a hand stand at the Institute of Contemporary Art at the Red Bull 2012 Cliff Diving World Series USA stop on Aug. 25, 2012. 8/25/2012 -- BOSTON -- Spectators inside the Institute of Contemporary Art watch as Czech diver Michal Navratil dives past their window at the Red Bull 2012 Cliff Diving World Series USA stop on Aug. 25, 2012. It was a familiar scene at my first trip this season to cover the New England Revolution at Gillette Stadium Sunday night. With the visiting Montreal Impact, an expansion team new to the MLS this season, the Revs played true to their place at the bottom of the standings, squandering several scoring opportunities en route to a 1-0 loss. A frustrating night for the home town team, for sure. Foxboro, Mass. -- Revolution forward Saer Sene covers his face after failing to score in the second half in New England's 1-0 loss to Montreal at Gillette Stadium on Aug. 12, 2012. Foxboro, Mass. -- Revolution midfielder Benny Feilhaber goes after a loose ball as Montreal's Felipe Martins gets tripped up by Revolution defender A.J. Soares at Gillette Stadium on Aug. 12, 2012. Foxboro, Mass. -- Revolution goalkeeper Matt Reis can't make the save on a shot from Montreal forward Sanna Nyassi in the second half at Gillette Stadium on Aug. 12, 2012. Foxboro, Mass. -- Revolution defenders react after Montreal forward Sanna Nyassi scored in the second half at Gillette Stadium on Aug. 12, 2012. Foxboro, Mass. -- Revolution forward Diego Fagundez gets tripped up as Impact defender Jeb Brovsky closes in in New England's 1-0 loss to Montreal at Gillette Stadium on Aug. 12, 2012. Foxboro, Mass. -- Revolution midfielder Ryan Guy disagrees with a call in New England's 1-0 loss to Montreal at Gillette Stadium on Aug. 12, 2012.